My name is Chelsea Smyth and I’m a registered dietitian. I am also the current school meals fellow for National PTA and have been working closely with the 25 National PTA Healthy School Meals Grantees to help as they work to improve nutrition in their schools. In celebration of National PTA’s Healthy Lifestyles Month, I want to highlight five common school meals issues that many schools face, and the solutions our grantees have pursued. Maybe you’ll want to try one of these ideas at your school! Issue 1: The Cafeteria Isn’t Inviting or Doesn’t Support Healthy Messaging or Behaviors. 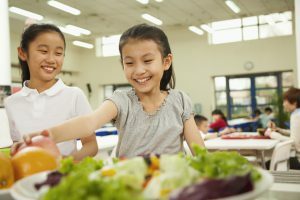 School-aged children are at the age when they form dietary preferences and habits and the cafeteria has the ability to promote healthy or unhealthy food habits. Therefore, it is important to make sure that the healthy choice is always the easy choice. Many schools identified that the cafeterias were unwelcoming and the items on the service line needed to be rearranged to encourage healthy behavior. We have five PTAs who are going to be updating their cafeteria with murals of healthy choices. Another four PTAs are rearranging items within the service line to make the healthier choice the easy choice, such as placing white milk before flavored milks and adding grab-and-go fruits and vegetables to the beginning and end of the service lines. Working on meal and menu quality can be an opportunity to advocate for healthier, tastier menu items and food preparation practices that improve students’ enjoyment of mealtime. Updating the school meal menus was the most popular task that our Healthy Schools Meals grantees set out to accomplish. Nine PTAs are going to be conducting taste tests with students and families to gain feedback for new menu items. These taste tests are planned to occur in the cafeteria, the classroom and after school events. We even have a PTA in New Jersey that is going to have a Top Chef-style competition utilizing produce grown in their school garden. The winning recipe will be featured on their school lunch menu. Increasing parent and student perceptions and knowledge of the school meals program can help increase participation and support. Communicating to students and families all of the all great work our PTAs are working on is a key component to the School Meals Grants. My favorite example of improve school meals communication is happening in a local PTA in Wisconsin, where students will be making videos highlighting their school lunch program and nutrition, which will be shared on the school’s social media channels. If food service teams don’t have proper training or up-to-date equipment, it is difficult for them to provide students with healthy, tasty school meals. To fix this issue, six PTAs are implementing new salad bars in their schools. Several PTAs chose to purchase new water dispensers to provide student with clean, fresh water as a beverage alternative, some of which feature a water bottle counting feature to tally how much water that the students are distributing. We also have one PTA that has provided training to the food service staff on preparation and food presentation techniques. Ensuring local and district wellness policies promote strong nutrition standards, provide students with adequate time to eat and limit the sale of unhealthy food items can help make healthier food choices the easier choices. We have several PTA grantees who are working to improve their school wellness policies. These PTAs are going to work with the school-level and district-level administration to create healthier environments for their students. A common theme among these PTAs is ensuring that students have adequate time to go through line and eat their meal. These are just a few highlights of the plans for the Healthy Schools Meals grantees. Do you see something that you would like to learn more about? 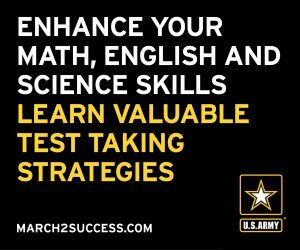 Is there a strategy that you would like to try? Check out the School Meals Leaders Guide at PTA.org/SchoolMeals or email Programs@PTA.org for more ideas and information on how to organize a school meals team, evaluate your current school meals program and make important changes to improve your child’s nutrition. Chelsea Smyth is a registered dietitian who is currently works in the clinical setting. She is pursuing a master’s degree in public health from George Mason University and hopes to combine her nutrition background and public health degree to work towards obesity prevention.